T0001 is usually used in Awlgrip and Awlcraft 2000 Topcoats. T0001 is also recommended for use in Quik-Grip Primer. 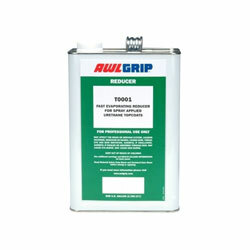 Awlgrip reducers are chosen according to spray or brush application and anticipated temperature. Use T0001 in AWLGRIP® / AWLCRAFT® 2000 Top coats when application and cure temperatures are between 60°F to 70°F (16°C to 21°C) and 80°F to 90°F (27°C to 32°C). At 60°F to 70°F (16°C to 21°C), T0001 will keep the paint film open for good flow but evaporate fast enough to provide adequate dry and dust-free times. At higher temperatures, the solvency of T0001 helps maximize atomization. Its fast evaporation rate allows the solvent to exit the film before skinning occurs, avoiding solvent entrapment or solvent "pop"
quarts of mixed base and converter: 25% would be 1/2 quart of reducer. For specific reduction recommendations see individual product data sheets. NOTE: At higher temperatures, reducers evaporate faster. When painting in hot conditions increasing the amount of reducer in the mix by 5-10% will help compensate for this factor.